The Hoxton in Shoreditch was the go-to for style-conscious travellers too old for hostels and too young for Claridges. The rates were on budget and the hotel kept East London in its thrall. So it’s a lucky day for those who don’t go east of Holborn. The new central London incarnation has 174 rooms, ranging from ‘Shoebox’ to ‘Roomy’; true to their word, most rooms are ‘cosy’ and pennies are pinched at breakfast, with ‘bags’ of yogurt and fruit. 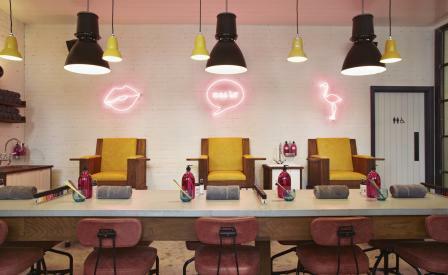 But the hotelier makes up for that in the common spaces with an American-style grill, rotisserie-chicken shop, coffee house and nail bar, all managed by the Soho House Group. The best perk of all: the hotel swallows the cost of WiFi, mineral water and an hour per guest of free landline calls to the US, Australia and most of Europe. A supporter of creative culture, the hotel launched with an immersive theatre performance by entertainment outfit, A and B Productions. A satire on the contemporary world of show business, art and celebrity culture, hotel guests were whisked around on a tour quite unlike any other.